Whenever you spend click to draw 1 card (not through a card ability), draw 1 additional card. One of the wealthiest and most powerful areas of New Angeles, Laguna Velasco is also known as the Government District. A drawing dual to Magnum Opus (MOpus) and Professional Contacts (ProCo). Same credit cost as those two, same influence cost. The big difference is that Magnus Opus takes 2 MU while the other two are resources and Laguna Velasco District (LVD) is unique unlike both MOpus and ProCo. However MOpus and ProCo have paid abilities and LVD triggers off a normal click action so in effect while you could install multiple MOpus and ProCo you normally would treat them as unique. In terms of effect the card is simply: draw 2 for the price of one. It simply makes clicking for credit pretty efficient. Consider that Diesel lets you draw 3 cards for but since you've already had to draw and discard Diesel itself the net gain is 2 cards, the same as LVD. Note that LVD has a particular phrasing which means that unlike MOpus and ProCo you draw with a normal action, not a paid ability. 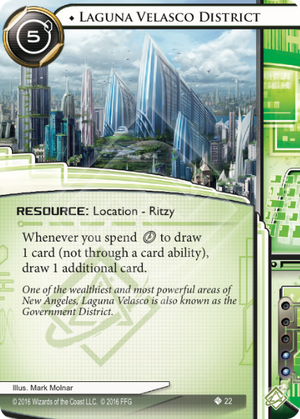 I couldn't find any corp cards that trigger off the runner drawing a card not through an ability but it wouldn't surprise me if a draw based dual to CPC Generator appears in the future and this detail would matter then. There is one runner card that triggers of LVD btw: Symmetrical Visage (thanks to @Eolas for pointing that out). At best Symmetrical Visage gives you one credit every turn, if you draw every turn. But since Symmetrical Visage is only 2 to install it does provide some interesting, dare I say it, synergy with LVD. So when should you use LVD? Obviously it's not cheap at 5 so if your deck doesn't generate much credits you're better off with alternatives like Diesel. It's also a resource which makes it vulnerable to tagging and both its cost and effect make it a prime target for a snipe by the corp. Tags can hurt in many ways though so most decks will already have some kind of counter. Still, if you're going to float tags LVD is obviously not for you. Overall LVD is a powerful card that brings symmetry to the shaper line-up of costly efficiently boosters. I expect it will find a spot in many shaper decks and even elsewhere (*cough* Sunny *cough*).